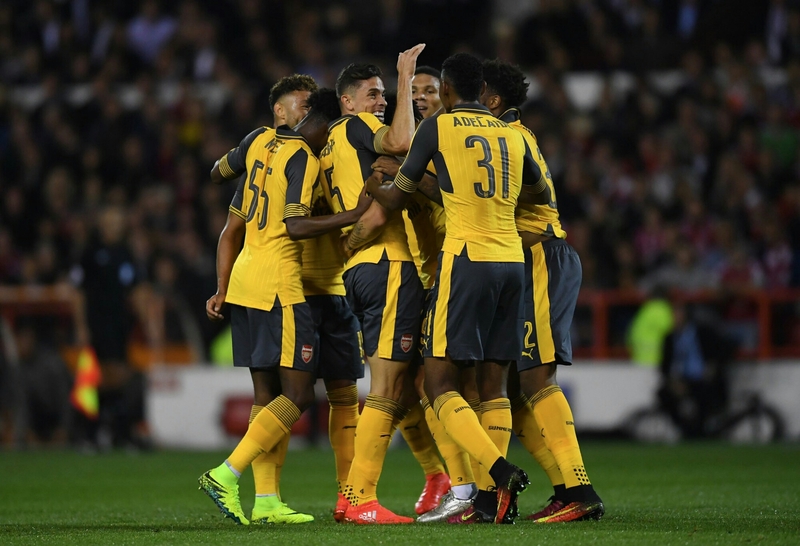 Arsenal went, saw and conquered Nottingham Forest in the 3rd round of the English Football League Cup last night. Wenger made 11 changes to the starting 11 at Hull City. Martinez manned the post with a centre pairing of birthday boy Holding and Gabriel, who was making his first appearance this season. They were flanked by Kieran Gibbs – captain of the night – and young Maitland-Niles on the right. Xhaka, El Neny, Rene-Adeliade, Chamberlain, Akpom and Lucas Perez made up the starting 11. Chris Willock, Bielik and Zelalem made 2nd half appearances. It was a 4-0 whitewash as the Gunners strolled into the 4th round. Xhaka opened the floodgates with another bullet from 30 yards. The goalie got a hand to it but the Swiss got his 2nd goal in consecutive matches for the Gunners. The goal was lovely and I think it is good to expect more. After the break, Chuba Akpom was brought down in the box and Lucas Perez converted the resulting penalty to open his Arsenal account and double Arsenal’s lead. The Gunners have had 5 penalties already this season. Last season they had just 3. Played through by Akpom, Lucas showed ruggedness and determination to get his brace and Arsenal’s third to snuff any hope of a comeback by the host. Lucas later turned provider for Arsenal’s fourth in the closing minutes as Oxlade-Chamberlain slotted in. Bendtner put up a decent game, got a yellow for hacking Xhaka and shot narrowly wide in the 1st half. He gave key passes which were not converted. We wish him well. Next up for the Gunners is Chelsea. In the other EFL Cup matches, Chelsea needed extra time as they came from 2-0 behind to defeat Leicester City 4-2 at the King Power Stadium. Fabregas had a winning brace. Liverpool were 3-0 winners at Derby County. Bournemouth lost 2-3 at home to Preston North End while Everton were defeated by Norwich 2-0 at Godison Park. In the NPFL, there are three rescheduled games today. Abia Warriors host Enyimba in the Abia Derby. Heartland have their relegation battles in their hands as they welcome Niger Tornadoes while Kano Pillars welcome El-Kanemi Warriors. It is a wet day in Lagos. Time to enjoy it.